While sports tunnels have a long-standing record of pumping up school spirit at games, they also contribute to the atmosphere and excitement level at dances, community events and other school functions. Using just the tunnel or the detachable wall/arch gives instant recognition to the school and the opportunity for selling sponsorships on the tunnel or arch are doubled as well. 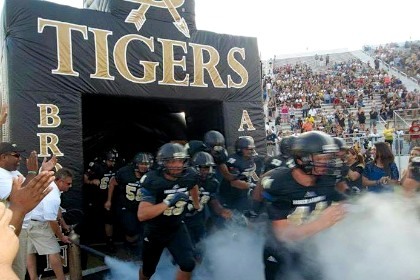 Broken Arrow High also ordered an inflatable double arch. Read that case study here. Thinking of getting an inflatable sports tunnel for your school? This hybrid version might be a better choice. Let us know if you have questions. We’re always happy to help.